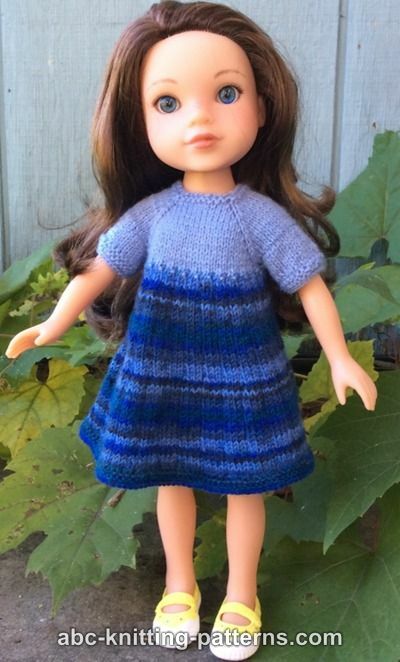 I've recently gotten into the Wellie Wishers line of dolls and have been working up some outfits for them. 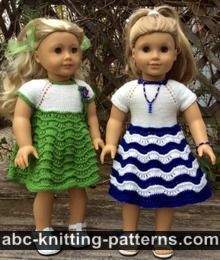 For those who don't know, Wellie Wishers are a brand new line from the American Girl Doll company. They are sized a little smaller than the regular American Girl Dolls. 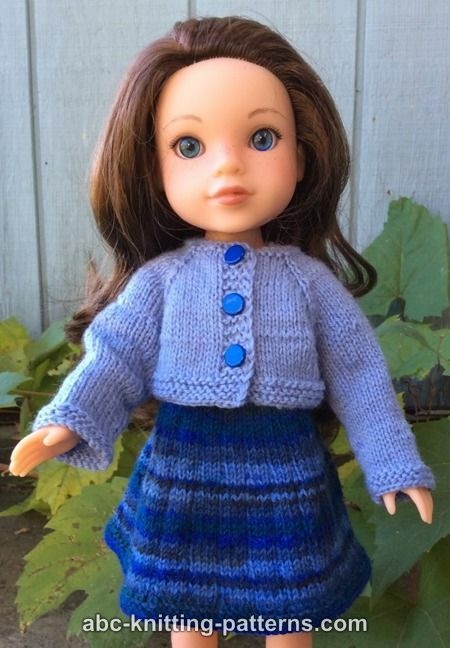 This outfit will fit HeartsForHearts Dolls as well. 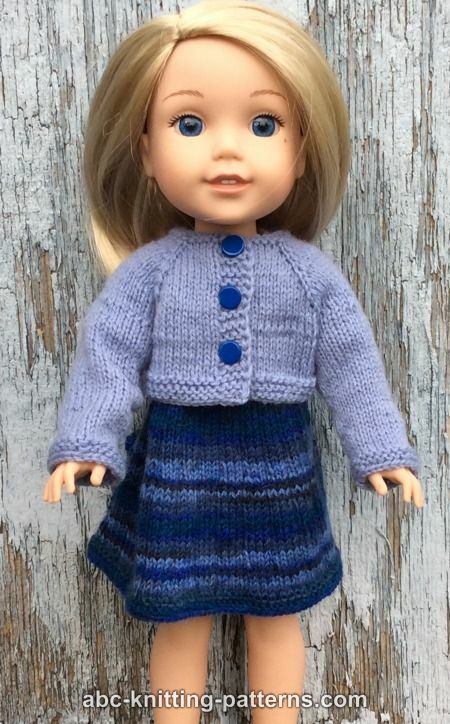 This dress-and-cardigan ensemble is perfect for the fall weather, when it's still warm enough to wear a skirt, but the evenings are getting chillier. 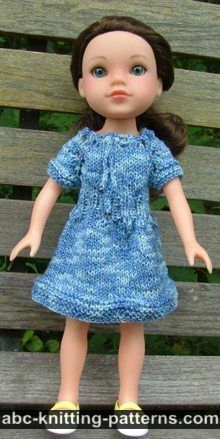 Of course, the items can be knitted and worn separately. 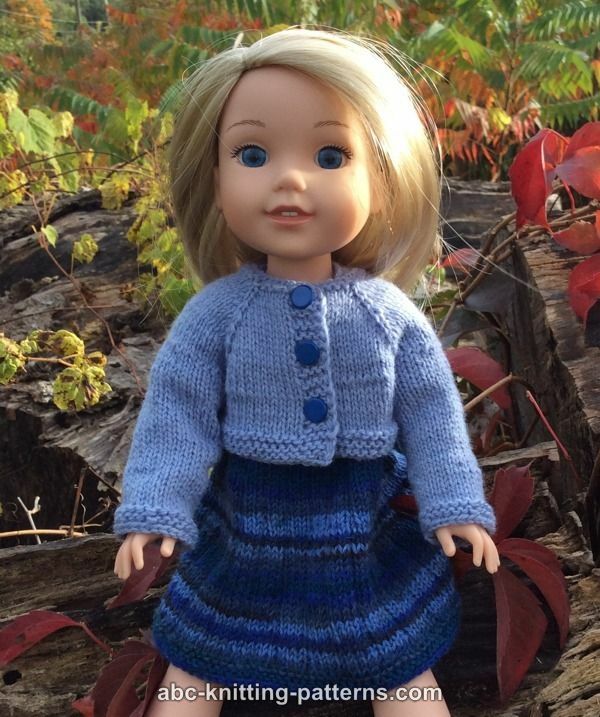 The Knit Picks yarn I picked beautifully matches Wellie Wishers Camille's blue eyes. Buy Wellie Wishers and HeartsForHearts dolls on Amazon.com for the best prices and quick shipping! Notions: 4 stitch markers, yarn needle, 3 sew-on snaps, sewing needle and thread of matching color. The selvedge stitches are worked as follows: slip the first st and purl the last st.
Raglan increases: Increase for raglan by making 1 st (m1) on each side of marked stitch in every RS row. There are 4 raglan lines (marked sts), so every RS row the number of sts increases by 8. The dress is worked top-down back-and-forth, then in-the-round with raglan sleeves and button band on the back. The button band is worked in garter stitch. 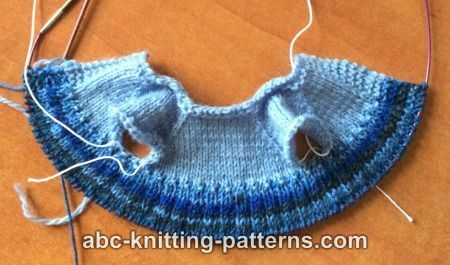 The sleeves are worked on dpn in the round. 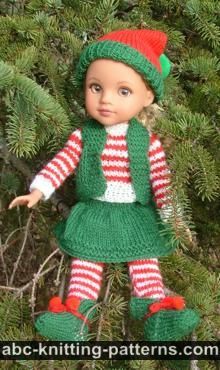 With solid colored yarn, cast on 38 sts, work 2 foundation rows in garter stitch - knit both rows. Check the stitches and place markers: 1 selvedge - 3 button band - 3 back - 1 raglan (place the first marker before this st) - 6 sleeve - 1 raglan (place the second marker before this st) - 8 front - 1 raglan (place the third marker before this st) - 6 sleeve - 1 raglan (place the forth marker before this st) - 3 back - 3 button band - 1 selvedge. Row 2 (WS and all WS rows): sl 1, k3, purl all sts till the last 4, k3, p1. Repeat rows 3-4 seven more times. Row 18 (WS): sl1, k3, purl to the last 4, k3, p1. Cut solid color yarn. Attach sock multi-color yarn and continue with it. Row 20 (WS): sl1, k3, *k1, p2 - repeat to last 4 sts, k3, p1. Row 21 (RS): sl 1, k3, *k2, p1 - repeat to last 4 sts, k3, p1. Row 22 (WS): as row 20. Row 24 (WS): sl1, k3, * k1, p3 - repeat to last 4, k3, p1. Row 25 (RS): sl1, k3, *k3, p1 - repeat ro last 4, k3, p1. Repeat rows 24 and 25 four more times. Repeat row 24 one more time. on the spare needle, then in the first stitch on the left needle and knit both sts together. Repeat with the remaining 3 sts. Place a marker between the sts of the button band - leave 2 sts in the end of the round and 2 sts in the beginning of the round. Rounds 2-7: *k3, p1 - repeat from * across the round. Round 9: *k4, p1 - repeat from * across the round. Repeat round 9 seventeen more times or to desired length. Work the last 4 rounds in garter stitch. Bind off. The round will start at underarm sts. Knit 7 rounds. Work 4 more rounds in garter stitch. Bind off. Weave in yarn ends, sew on snaps on the button band. Notions: 4 stitch markers, yarn needle, 3 small buttons, sew needle, sewing thread of matching color. The cardigan is worked top-down, seamless, back and forth in stockinette stitch with raglan sleeves. Raglan increases are worked with m1 before and after the marked raglan stitches in each right side (RS) row, thus the number of stitches in each RS row is increased by 8. The button band is worked in garter stitch - all rows knit. The button holes are made on right front (RS, the end of the row) by k2tog, yo in the following rows: 3, 13, and 23. 1 selvedge - 3 button band - 4 front - 1 raglan (place a marker before this st) - 7 sleeve - 1 raglan (place the second marker before this st) - 9 back - 1 raglan (place the third marker before this st) - 7 sleeve - 1 raglan (place the forth marker before this st) - 4 front - 3 bb - 1 selvedge. Row 4 (WS): sl 1, k3, purl to last 4 sts, k3, p1. Repeat rows 4-5 three more times. Row 12 (WS): repeat row 4. Row 22 (WS): sl1, k3, p67, k3, p1. Row 23 (RS): sl1, knit to last 4 sts,yo, k2tog, p1. Row 24 (WS): repeat row 22. Row 25 (RS): sl1, knit to last st, p1. Repeat rows 24-25 two more times. Row 30 (WS): repeat row 22. Rows 31-34: work in garter stitch. Bind off. Cut yarn. Transfer 25 sts to dpn, distributing them evenly, pu&k 5 sts underarm = 30 sts. A round begins with the first underarm stitch. Round 5: work underarm sts in the following way: k2tog, k1, ssk, work the remaining sts as established = 28 sts. Rounds 6-14 knit 28 sts. Work rounds 26 - 30 knit 24 sts. Work 4 more rounds in garter stitch, bind off. Cut yarn. Weave in the yarn ends. Sew 3 small buttons onto the left front. Thank you for this cute and easy instructions to follow! 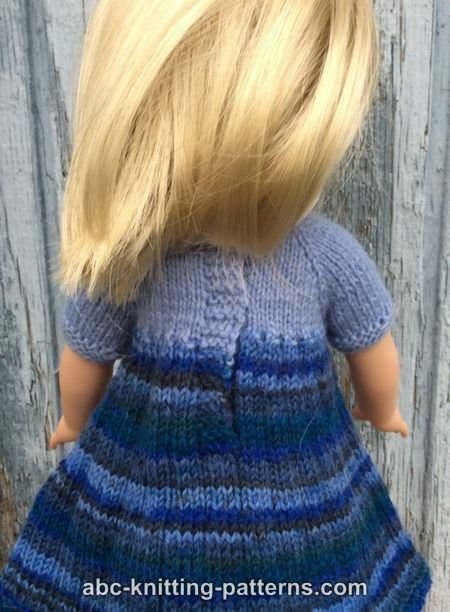 Do you have a pattern for toddlers? If so, please, forward it to my e-mail. 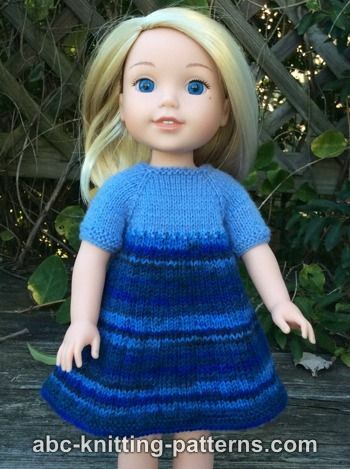 What a treat to receive this unexpected charming free pattern. Thanks!